Enjoy dozens of signature floral compositions highlighting the wide breadth of flower arrangement styles in one of Japan’s most cherished art forms, during our Fall Ikebana Festival. As we do each autumn, we are again opening the Gardens to the talented adepts of five different schools of Ikebana practice. The result: elegant floral displays throughout our grounds and museum that capture the harmony, discipline, and refinement of traditional Japanese flower arranging. This year the Fall Festival runs from Tuesday, November 20 to Wednesday, November 28, with the exception of Thanksgiving Day, when Yume will be closed. Admission is $15 for adults and $5 for children under 15. Be sure to combine your Festival visit with a walk through our newest museum gallery, featuring a permanent display of selections from our collection of more than 200 Ikebana vases and vessels – the largest in the nation. 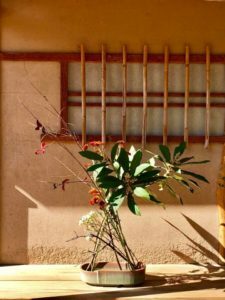 Made of bamboo, bronze, lacquer, clay, and glass, some are more than a century old, others are contemporary; all are carefully designed to complement the Zen-like spirit of the flower arrangements they hold. Yume Gardens is open 9:30 a.m. to 4:30 p.m.